Armored car transport is a vital component in many fields and industries, and our line of armored transport vehicles addresses this need. We offer armored trucks, armored vans, and prisoner transport vehicles, as well as an inventory that includes SWAT vehicles, SWAT police cars, SWAT vans, Suburbans, military vehicles, and more. Make certain your company's armored transport needs are met by choosing one of our many available solutions. One look through our diverse inventory and you'll realize the many solutions quite literally at your fingertips. Armored car transport solutions are a component of our company, and we offer the highest-rated armored trucks and armored vans on the market today. 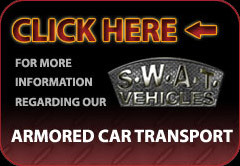 In addition, we feature SWAT vans, military vehicles, armored Suburbans, prisoner transport vehicles, and much more. Explore our inventory for your armored transport solutions. We are a leader in armored car transport by virtue of the solutions we offer. In fact our armored trucks and armored vans set a standard for engineering and design. Look to us as so many other not only for armored transport solutions, but also for SWAT vehicles, and much more.